This is an excellent app. I wish I had it when I was a student. The ability to compose complex equations visually and then evaluate them instantly makes the iPhone a superior scientific calculator that, with this app, takes the concept to a new level. You literally touch the equation to edit it and can enter values to evaluate it. The visual representation lets you instantly recognize errors in composition, unlike formulas encoded in textual representations. You can share it, use templates and re-use it. It even exports to PDF for use with other documents. 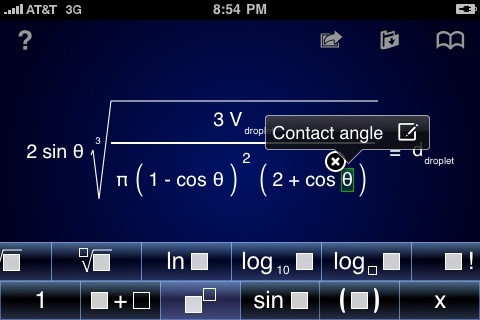 If you are a student of any discipline where math is used, this $9.99 app is a no brainer. If you are a professional engineer, scientist, or an analyst like myself, this is an app you can’t afford not to have. Available at the App Store here.